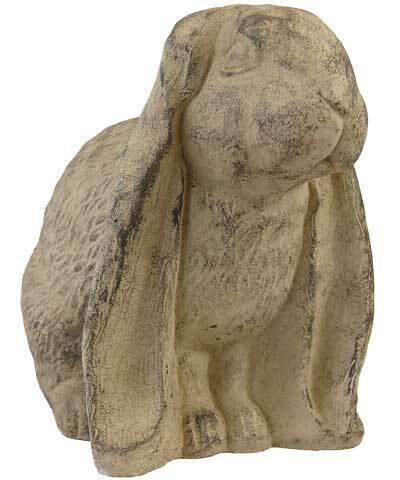 Bring adorable wildlife to the forefront of your yard using this Athens Desert Sand Brown Sitting Flop Ears Rabbit Statue. Realistic detailing on this figure�s face and body lend remarkable style to your garden, while its extra long ears reach from its head to the ground for a recognizable look. The beige finish throughout this robust unit celebrates the natural world, while darker brown hints on the raised sections highlight the amazing detail. Its rounded back and forward gaze bring a watchful motif to the piece, and the concrete body remains durable throughout the warm months outdoors. Place the item indoors when the weather turns cold to keep it protected and usable for many seasons. Add an adorable animal to your garden d�cor with this Desert Sand Brown Sitting Flop Ears Rabbit Statue. Note: Each item is hand cast with an artisan finish and each item may vary slightly in terms of color and texture. Due to the inherent nature of stonecasting, small scuff marks, scratches, and chips are to be expected and add to each item's unique character.